This picture comes from Susie Hairston and Isabella Soparkar, Honorable Mentions. On the Brave Writer Moms Yahoo List, we had a writing contest during October. 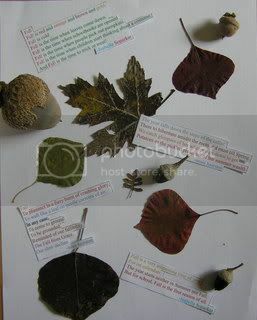 The contest asked Brave Writer Lifestyle Families to write a collage about fall. Each family member was asked to contribute at least one piece of writing, but all in one piece. The collage could include poetry, quotes from books or songs or poems, a color walk, a freewrite, dialog, jokes, personal experiences, memories, or fiction… in short, the collage would be a collection of pieces of writing written by several family members and submitted all together. Collages don’t have to have transitions. They benefit, though, from an organizing theme. Quotes from outside sources were allowed as part of the finished project. I asked the families who submitted collages to include a short description of the writing process they went through so that I could share those with all of you as you learn how to apply the Brave Writer philosophy to your family. These brave families did a superb job of taking this ball and running downfield with it! I kept calling out to my husband as I read the entries: listen to this terrific analogy, or don’t you love this word pair? I promised to announce the winners here. The Grand Prize winner will receive either a copy of The Writer’s Jungle or Help for High School (or an equivalent in Brave Writer materials if the family already owns these). The runners-up (two) will receive two back issues to our language arts programs (the Arrow, the Boomerang or the Slingshot). Over the next couple of days, I’ll post some excerpts from the truly wonderful pieces I received, as well as how the writing process unfolded for these families. They have great ideas for how to inspire young writers. I’m floored by the outpouring of creativity and energy. Even a few dads and one grandpa joined in the fun! Our winners come from two different countries. How cool is that? First Runner-Up: The Page Family, led by the delightful Teresa Page from the good ol’ U.S.A.
Second Runner-up: The Lippert Family, galvanized into creativity by the ever industrious Stacy Lippert also from the U.S.A. This entry is filed under Contests / Giveaways, General, Writing Exercises. You can follow any responses to this entry through the RSS 2.0 feed. Both comments and pings are currently closed.